Since the Financial Crisis, global monetary policy has driven interest rates lower forcing the price of other income-generating assets higher. This has in turn reduced the natural yield (income) available to the everyday investor. Though rates are now starting to rise once more, the gap between rates on offer and those desired by income-seeking investors has led some to take unnecessary risks in their portfolio. This can be termed ‘reaching for yield’. This article highlights the risks of this approach starting with why and how bonds, or fixed interest, is used in a portfolio. Traditionally, when an investor purchases a bond they are technically lending a set amount of money (the principal) in return for a fixed, periodic income payment (the coupon). The investor then receives the agreed payment each year until the bond matures, at which point they receive back their original investment. Unlike a dividend payment, the income payment on a bond doesn’t change and can’t be missed, cancelled or cut – hence the term ‘fixed income’! The income payment, and therefore initial yield, on a bond (the coupon as a percentage of the bond’s starting value) is generally linked to the risk of default. When it comes to yield there is no such thing as a free lunch. To earn a higher income an investor is required to take on more default risk. In other words, as the probability of receiving back your original investment decreases (default risk increases) you are compensated with a higher level of income. We can add some colour to this by comparing the current yield on the UK Government Bond Index, an index representing most of the UK Government Bond market which has a very low default risk, to that of the Global High Yield Index, which is made up of bonds with a higher default risk from around the world. An extra 2% of income from the riskier Global High Yield bonds might look attractive to an income-seeking investor, but is it worth the increase in default risk? To answer this, we need to remind ourselves of the role bonds are meant to play within an investment portfolio. Typically, bonds are held in a portfolio for their reliable income stream and stabilising effect. In theory, during a period of market weakness the bond portion of a portfolio will maintain its value better compared to that of the equity part. Behaviourally, this usually helps an investor to remain invested in line with their long-term goal as the short-term losses seen in their portfolio are not as severe. 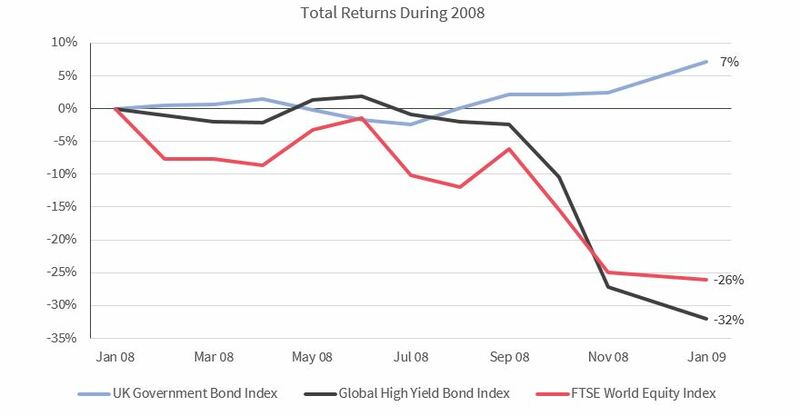 Using the Global High Yield Bond Index as an example, during favourable market conditions these higher-income assets perform well, and at the time the perceived additional default risk can appear reduced. An income-seeking investor would therefore rather hold this type of bond, paying the extra 2% income, instead of the UK Government Bond Index. However, in less favourable conditions this reach for yield could prove a costly mistake. As the above shows clearly, just owning high yield bonds during 2008 was painful: they were down by 32% by the end of the year. More importantly though, if an investor had been holding these as the safer bond portion of their portfolio, they would have been severely distressed seeing this part fall as much as the equity portion. The above is an important reminder that reaching for yield ultimately involves increasing the risk and, in some extreme cases, altering the risk of an entire portfolio. Though it is possible to tilt investments towards higher-income-paying assets, if done in excess, investors could be taking more risk than they realise. Investors must remember that we can only invest in the markets as they are, not as we would like them to be.